It’s Walking School Bus Week across Auckland and the ADM is tackling the issue of walkability in the city. 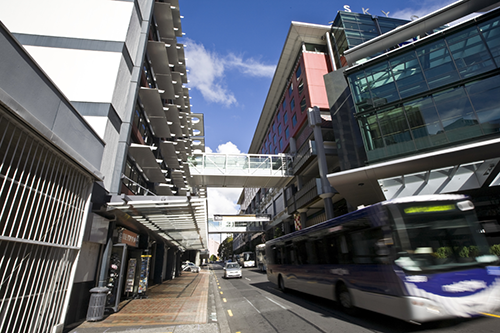 Following on from last week’s post on why Auckland should be more walkable, we look at one of the recent walkability success stories – the upgrade of Federal Street. Federal Street was once a back end service street with little pedestrian appeal. During the day, it was clogged with parked taxis and coaches. Private cars cut through, rat-running between Wellesley Street and Victoria Street, while infrequent pedestrians edged along the street’s cluttered and narrow footpaths. At night, Federal Street was a lifeless space where few people lingered. Transforming Federal Street into a bustling and pedestrian friendly shared surface was never going to be easy. Aside from the traffic, the street had additional constraints: a high number of emergency exits, basement parking, numerous utility services beneath the street, and limited access to sunlight, due to the high walls framing the street on both sides. Despite these design challenges, or perhaps because of them, Federal Street was ripe for change. For the council, transforming Federal Street into a pedestrian-priority shared space is an important step toward delivering their long term vision for the city centre (as depicted in the City Centre Master Plan 2012). The plan is for Federal Street to become part of an emerging pedestrian laneway circuit linking Aotea Square to the Harbour. 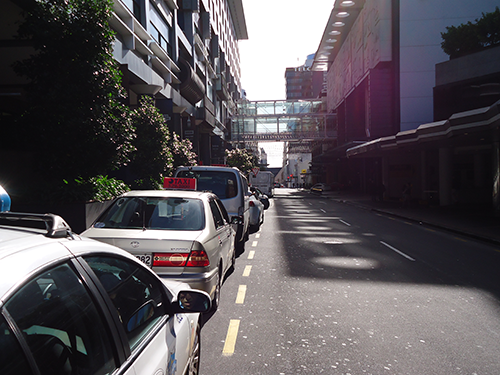 For future City Rail Link (CRL) commuters walking from the planned Aotea Station, the lane-way would become a key route. For SkyCity, the transformation was an opportunity to enhance the area around the Sky Tower and celebrate it as a main attraction along the future pedestrian laneway circuit. 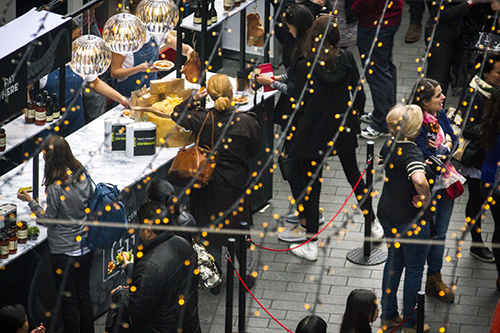 SkyCity also saw the benefit of transforming the Sky Tower entrance with a generous plaza space and clutter-free street to ensure the public has better access to SkyCity’s amenities. SkyCity and the council also have aspirations to repurpose some of their properties along the street to establish more retail and hospitality outlets. The present plan being to elevate the street’s growing reputation as a prime culinary destination with Bellota, Federal Street Delicatessen and The Depot, to name a few, already setting the gold standard. Walking down Federal Street today you’ll discover a much-improved ambience. The coaches and taxi ranks are no-longer a permanent fixture. Gone are the cluttered footpaths and the removal of a large canopy along Victoria Street has completely transformed the area beneath the Sky Tower. The plaza has been opened up, inviting people to soak up the bustle of the city, with the added thrill of watching people bungee from the Sky Deck far above. On warm summer evenings there’s live music playing outside Belotta and at the Wellesley Street end the concrete pillars are now softly shrouded by a selection of leafy New Zealand natives. But most importantly, there are people: people walking, people sitting, people talking and people dining. Federal Street after its upgrade. 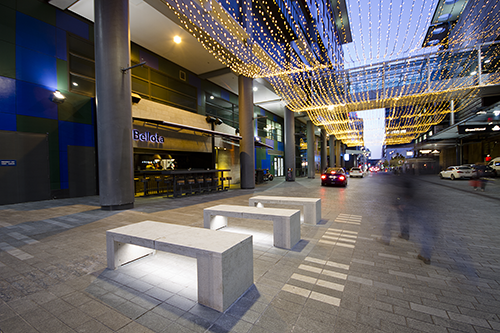 The shared space includes pedestrian furniture which acts as a traffic-calming mechanism. On the street itself, the proposed repurposing of adjacent buildings will also help to minimise the ‘concrete canyon’ effect, created by the super-block architecture that surrounds the street, and reinforce a more human sense of scale for pedestrians on Federal Street. Thanks to the transformation of Federal Street, the opportunities for an expansion of outdoor dining areas where people can sit, relax and watch the street activity are increasing. 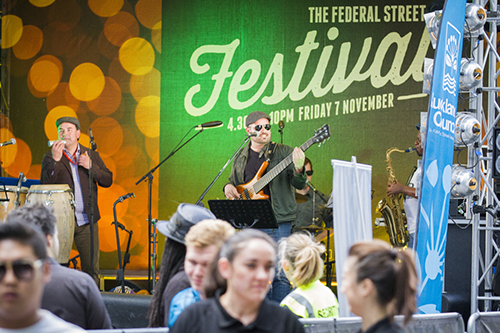 Federal Street now plays host to a range of pedestrian-friendly activities, including outdoor dining experiences and regular markets & events. In the years to come, Federal Street will continue to be a street in flux and transformation. 1) Work with neighbouring businesses to understand how our streets can better support them, as well as support a greater range of activity. 2) Keep planting simple when adjacent to the building edge to accommodate changing business activities over time. 3) Use investment tactically to generate value in the short term and lay the foundations for more ambitious opportunities in the long term. 4) Acknowledge the important role of street trees which provide a natural counterpoint to the hard materiality of the laneways themselves. 5) Use temporary interventions to test ideas, and better understand the opportunities for leveraging investment in our public realm. Check out the ADM’s Streets Hub for other exciting streets case studies, as well as our resources on how to design for health, activity and wellbeing. This Friday, we look at the ’20-Minute Neighbourhood’ concept and whether it could be adopted in Auckland.